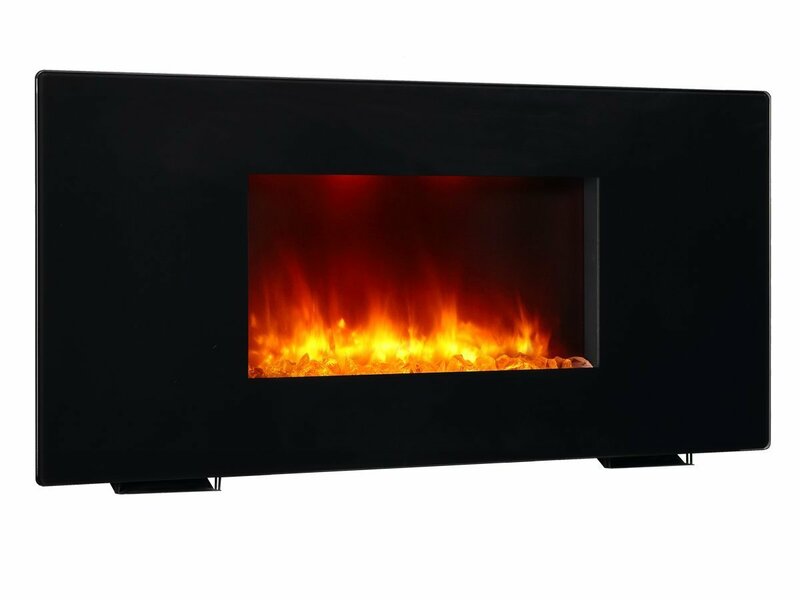 Welcome to our comprehensive Bionaire Electric Fireplace Heater Review, Model #BFH5000-UM. 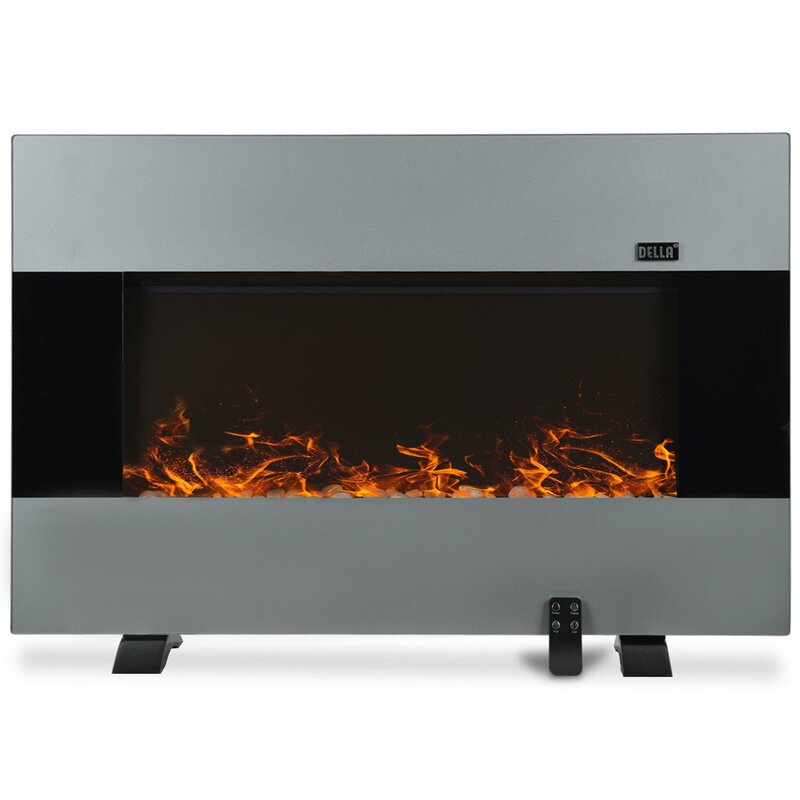 Spoiler Alert: We really like this portable electric fireplace for its’ great modern styling and the presentation on the stand which opens up lots of unique possibilities for placement. 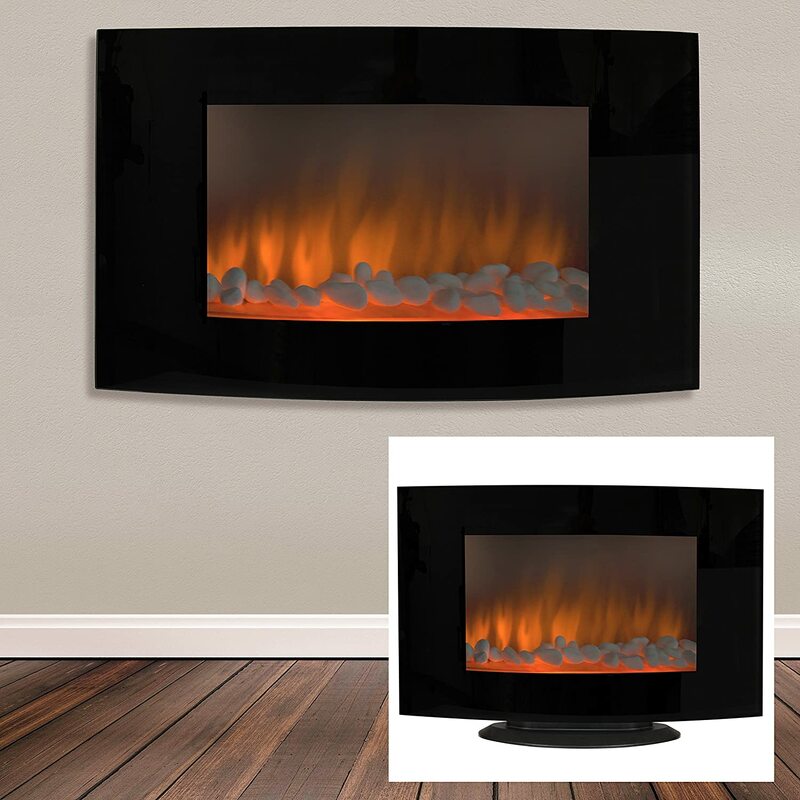 NOTE: If you have arrived on our site and have decided to buy the Bionaire electric fireplace heater then we recommend clicking through and checking out this product and the daily discount. You will get very fast delivery (often free) and a great guarantee and service pledge. Check out the Bionaire fireplace video below and notice the flame effects at the different levels, as this is the first area we will address. What sparked our interest in doing a Bionaire Electric Fireplace Heater Review was the modern look of it and that cool stand. It was the first electric fireplace we have seen that comes with a stand (in addition to wall mounts), and seems to say ‘pick me up and put me down wherever you need me’. The look and design definitely plays to plug and play portability and ease of use. This maybe even easier than an electric fireplace on caster wheels. The flame effects have 4 settings: high, medium, low and off. Hopefully, you checked out the video above for the quality of the flame and fire effects for yourself and made your own judgment. A few owners have stated that the flame effects are not that realistic and closely related to real flames. The Bionaire’s flames appear reddish and more ‘glowy’ than flicking and licking effect of real fire flames. Even among the people who commented on the flames not being realistic, there was a consensus among them that the flames are, none the less, a pleasing visual effect once you get used to them. Oddly enough, this is the first electric fireplace we have reviewed where the flames cannot be on and running independently of the fan. While the heat need not be on, the fan always will be. Maybe this setup is to cool the internal parts and lighting mechanism. Several owners commented that it was annoying. The unit uses 2 – 25 watt incandescent candelabra light bulbs. The most important question to address is ‘How large a space does this fireplace heater warm up’? Despite diligent research, we could not find a manufacturer claim for square footage heated. This might not be a bad thing, as most manufacturers generally overestimate their units heating capability. These comments fall in line with our experience with most electric fireplaces of this power, they do a good job on a single room. They can “take the chill off” a larger room or an open concept living/dining or living/family room space. They cannot be relied on as a primary heat source for the entire house, but can serve quite well as a component in a zone heating plan. This fireplace, with its extreme portability, really lends itself to keeping your thermostat low and just picking up and carrying it with you from room to room. For instance set it up in the living room while you’re watching TV, and bring it to the bedroom when you’re ready to sleep. The heater function is controlled by setting the thermostat to a desired temperature. The blue digital readout on te front of the unit displays the temperature you are set to maintain for about 5 seconds then goes out.The heat blows from a vent located on the front of the unit and blow out and down. When the temperature is reached that is set on the thermostat, the heater will shut off, but the fan will continue to blow and circulate air. This aspect of the heater seems to be a negative in our opinion. The fan and the resulting noise is always on even when heat is not selected. Speaking of noise it is not particularly noisy but there is an ambient background hum. The manual controls are located on the topof the unit and are marked by icons that are pretty clear, from left to right: On/Off, Thermostat, timer, Flame Brightness, Sound, Fahrenheit/Celsius. The full function remote control uses those same icons, (top to bottom on the remote). The remote control operates with 2 AAA batteries which are included. The timer is an incredibly handy feature and can be set with these increments: 1, 2, 4, 6, 8, 10, and 12 hours. You can pre-heat a room as well as set it to shut off after a specific time. It is very handy in the bedroom. There is an LED digital display on the front of the unit which shows you the various settings or cycling through. This display will last about five seconds and then shut off so as not to distract you from the viewing experience. This electric fireplace is the first that we’ve come across in the lower price ranges that offers sound effects. While I’m sure adding this feature was well-intentioned, it is universally not liked by owners. The sound effects have been variously described as: ‘an annoying sound like a whip cracking’ and ‘it sounds like someone hitting a tin can with a stick’. Virtually everyone agrees they simply leave it off. This electric fireplace does have an automatic over heat shut off. We recommend having it be the only appliance plugged into the outlet you will be using for the fireplace. While it is designed for a standard outlet, sharing the outlet with other appliances may lead to tripped breaker or blown fuse. The manufacturer does not recommend using the unit outdoors. Also, the manufacturer does not recommend using the unit in bathrooms, laundry areas or locating the heater where it may fall into a bathtub or other container of water. This is a pretty standard safety warning which is based on the simple fact that electricity and water do not mix. Click for the unit specific safety cautions and the Bionaire Owners Manual. We also did a n extensive post on general standard safety precautions for electric fireplaces. Put the 2 AAA batteries which are included (thank goodness), in the remote control. Install the 2 light bulbs for the flame effects by opening the rear access panel with a flat-head screwdriver. Set it down or hang it up, plug it in, and you’re good to go….it’s that easy. The Bionaire electric fireplace comes with two setup options: it can either be wall-mounted or you can attach the stand to the bottom and pretty much place it where you like: floor, end tables, on dressers even a TV or occasional table. The stand is secured to the bottom of the unit by the use of four included machine screws. Just lay the unit on its side and attach the stand to the bottom of it. This is really simple to do. The wall mount setup includes two brackets which are attached to the wall with a total of four toggle bolts, two for each bracket. The two brackets are leveled, secured to the wall, and then the fireplace unit is hung on them. The included hardware is a set up primarily for drywall installation. There is a paper drilling template included. The degree of difficulty for the bracket installation is about as hard as hanging a picture with two brackets. Tools Needed: Phillips (star) and flathead tip screwdriver. If you are going to utilize it as a wall mount electric fireplace, you will need a drill and a level for the mounting bracket installation. The cost of operation may be slightly higher than other fireplaces when operating in flame only mode because the fan is constantly running. We are making an educated guess that the fan and flame may draw 500 watts of power making the cost of flame with fan mode about 6 cents per hour. Therefore, using the flame effects mode and assuming 5 hours of use each and every night it would add about $9.00 per month to your electric bill. That figure may be high. Values= 1500 watts high heat + flame, 500 watts for fan and flame. Fill in your states KWH cost, the hours you think you will use it per month and generate results. Overall Product Weight: 25 lbs. The sleek modern design is a fashion forward design statement. It comes with a nice stand that makes it incredibly portable and versatile. The timer is a great feature as well as the incrementally set thermostat control. The front blowing, downward angled heat discharge eliminates a lot of concerns about placing it near a TV or stereo. Good value for the price point. The flame effects made this be disappointing if you’re looking for fire and flame realism. The fan, and the attendant noise is always on. It cannot be turned off. The audio effects are poor. Instead of snap crackle and pop, you get bang, crack, and clang. At 4 feet, the cord is relatively short. For even more in formation click here for: Pros and Cons of Electric Fireplaces or Pros and Cons of Wood, Gas and Electric Fireplaces Comparison, or electric fireplaces. Of the 150 buyer reviews examined about 2/3 rated the unit 4 or 5 stars. There were a number of older reviews that were 1 star when the fireplace had some electrical problems for some buyers. Depending on the daily discount being offered, this electric fireplace costs between $200 and $300. That places it in a low-moderate price range. It is a very unique electric fireplace heater offering good versatility. Click image below to get the daily price. In the design sense, it is unique and modern. The heater functions fairly well. The warranty is for 1 year. Customer service – at 1-800-253-2764, Mon-Sat. Frankly there are better options. However, this could be the fireplace for you if you are looking for a modern design and very portable fireplace. The unit can be situated were many standard fireplaces cannot.